A really good heated birdbath can be expensive. While I did look at birdbaths when they were on sale this fall at my local bird store, I just couldn’t spring the money for one. As well as the price of a good one (although it really was a good sale), I had a few other concerns. One was that I wasn’t happy with the pedestal design of most birdbaths. They often have an old-fashioned almost Victorian look to them that doesn’t fit my yard. There were some four-legged birdbaths with a more Asian style that I liked, but I also worried that the concrete would crack with freeze and thaw cycles during the winter. (The concrete birdbaths had tags suggesting that you bring them inside when the weather gets cold.) My final issue is that I suspect that birds are happier with water on the ground as they more typically find it in nature. 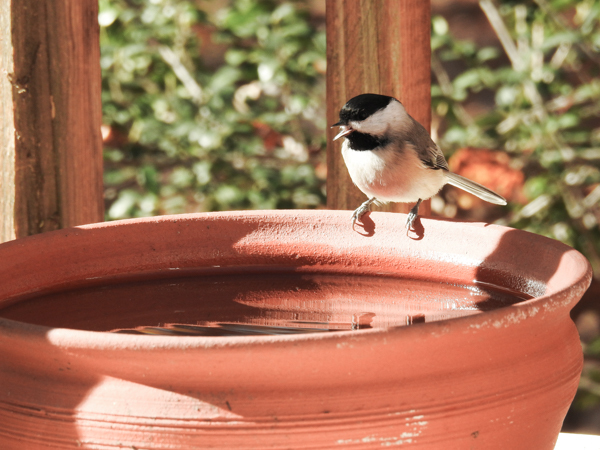 During the warmer months, I had been using a shallow terracotta pot saucer on the ground near some thin bush cover and the birds had been loving it as well as a deeper terracotta pot on the front porch that the Carolina Chickadees became quite fond of. But I figured that a terracotta container full of water that freezes and thaws would crack over the winter. I wanted something else. So I thought about it and decided to improvise. I went to the local home improvement store (Lowes) and purchased two very large plastic pot saucers. These are deeper than the original shallow terracotta saucer and so were initially less popular. At first I tried putting the saucer up on a cinder block but found that being up off the ground, it got icy quicker. Also, I found that once on the ground I could more easily put branches over and near them which was helpful in making them more accessible and provide perches to wait for their turn at the water. But when both the shallower terracotta saucer and the larger plastic saucer were available side by side, most of the birds picked the terracotta one. Once it got cold enough for the water to freeze at night, I brought the terracotta saucer and pot in for the winter and started going out each morning to crack and remove the ice from the plastic saucers and add to or replace the water with fresh warm water. This was fine when the days got warm enough for the water to stay unfrozen but not when the temperatures stayed in the teens or twenties and frankly, it was a pain (and cold!) to do every morning. I solved my dilemma with two strategies: a heated pet water bowl for the front of the house and a birdbath de-icer for one of the large plastic saucers that is in the backyard. So far, this is working very well. I’ve actually had a heated pet water bowl for years. Purchased originally from a local pet store for the use of a neighborhood cat, it sits on my back step and I’ve had no problems with it. 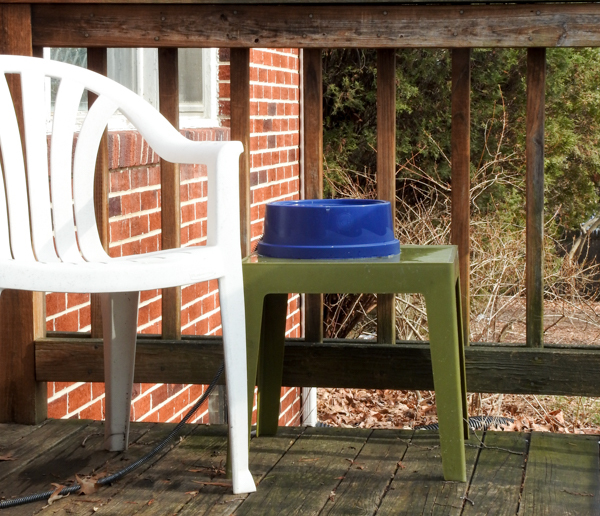 I purchased a second one this winter from Amazon to put on a little table on my front porch (K&H Manufacturing Thermal-Bowl Blue 96 Oz as it can be hit or miss finding them locally in my area. This second bowl was ignored by the birds very consistently until the weather got cold enough for the remaining plastic saucer birdbath out front to stay frozen. 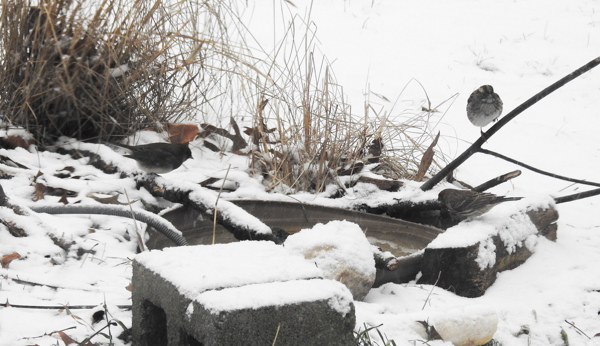 Then this heated bowl got to be a popular gathering place for the birds. While these bowls are too deep for most birds to actually bathe in (although a flock of American Robins did do just that last winter), they are fine for even the littlest birds like American Goldfinches to sit on the edge and get a drink. The trick with deep bowls like these is to keep them full very close to the top; if the bowl gets too empty, the little birds would have to tip forward and be almost standing on their heads to drink. I’ve also heard of someone who put a rock in this type of bowl to make it more shallow. I haven’t tried that and am not sure if this would cause any problems with the way the bowl works, but it might be worth trying. These pet water bowls are very inexpensive and they do have wire wrapped around the cords to protect them and the cord is fairly long. They are not thermostatically controlled so you do need to be careful to unplug them when the weather is warm and not let them become empty. I purchased the de-icer from Amazon (Allied Precision BDT250 Bird Bath De Icer ) It has a ten-foot cord and my saucer was out in the yard, so I needed to purchase an additional Master Electrician 20-Foot 16/3 Vinyl Landscape Outdoor Extension Cord and Hot Headz Extension Cord Safety Seal Water Resistant Cord Cover for where the de-icer cord and the extension cord come together. The de-icer is thermostatically controlled so that you don’t have to worry about outside temps or water temps, although once the weather warms up in the spring, I’ll bring it in to store until next winter. With either of these solutions, you need an outdoor electrical outlet with a GFCI (Ground Fault Circuit Interrupter.) If you don’t already have this, you might need an electrician to set that up for you. So how do they work? Very well. Here on the east coast, we recently had an actual blizzard and got about 30” where I live. 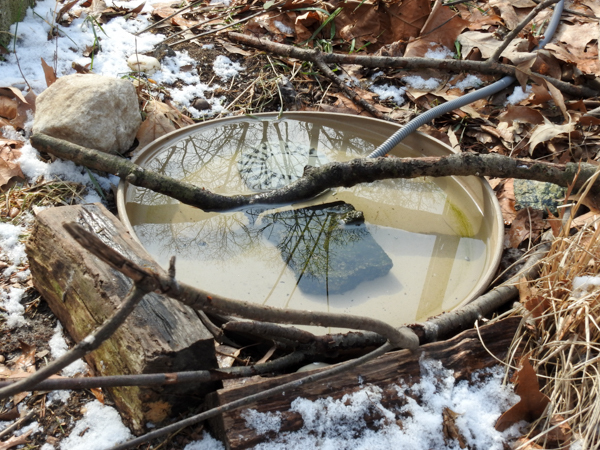 Each of the heated birdbaths, both the heated pet water bowls and the de-icer warmed saucer, stayed clear of ice. 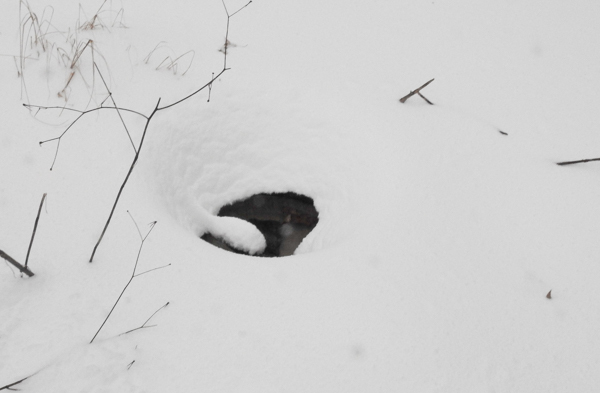 The snow did build up around them kind of like the cone of a volcano so I did need to clear away snow to give the birds access. They’ve been popular on cold days when most outdoor water sources are frozen. With a heated birdbath, I’ve had a few visitors who don’t come to bird feeders. 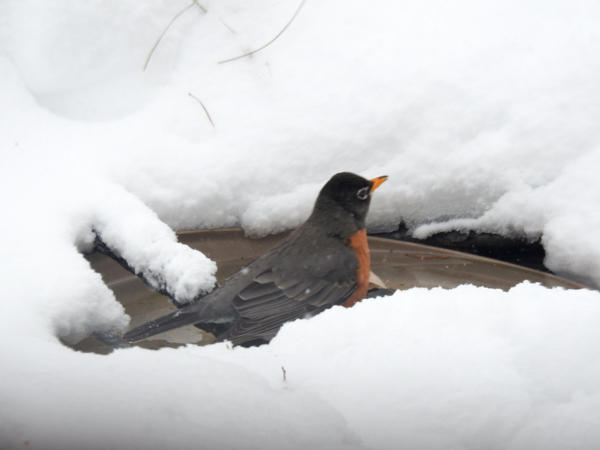 For example, during the blizzard I had an American Robin and a Mockingbird come to the birdbath. 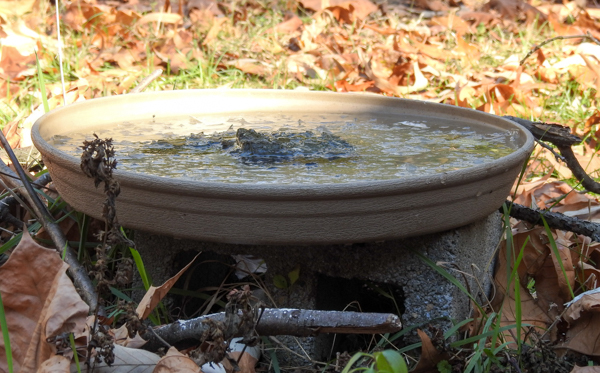 Having a heated birdbath does not eliminate all winter birdbath chores. Birdbaths that get used get dirty quickly. So you still need to go out every day and check the water. I add warm water to top them off every day. I dump the water and use a birdbath brush and/or paper towels to clean them about every other day as needed and then re-fill them. It’s still much better than having to crack and remove ice every day and it makes the birds quite happy. My Newest Birdbath Has Something to Hide!